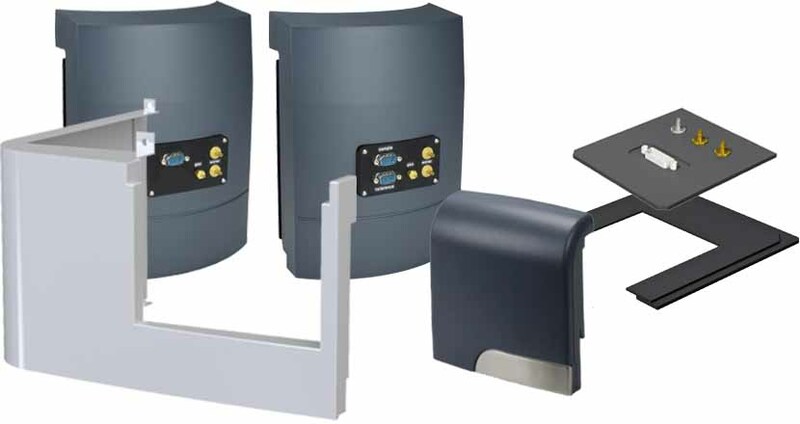 The Cary series of spectrophotometers offers some unique challenges for getting the necessary utilities (circulating water, dry gas and an electrical cable) into the sample compartment without disturbing a measurement. When needed, we can provide the necessary modified front covers with appropriate fittings attached. This is not a serious problem for the Cary 60. Utilities may simply be brought out of the sample compartment through a small door, held on by two screws, in the back of the spectrometer. Besides, the pulsed source permits measurements without excluding light. The various products that we make may be used in the Cary 60 with the front cover in place except for the qCHANGER 6, which requires a little more space in the front. For this reason, we provide a modified front cover for those who wish to operate the instrument closed. For the Cary 100 and Cary 300, we simply make our own front cover with the necessary utilities and include it as part of any accessory that we build for those instruments. The options for the front covers for the Cary 4000, 5000, 6000i and 7000 are more complicated. Front covers for these four instruments fit identically. We simply label them with the number 5000. We can purchase the front cover for these instruments and modify it for the utilities (see PANEL/5000 and PANEL/5000/x2). We can also provide the “Extended Nose.” (Agilent part number 10079800). You may already have this part. With the Extended Nose, utilities are brought out through an access panel underneath the front of the part. We make an access panel, but you will also need an adapter made by Agilent (part 110746990).